The First Minister has paid tribute to the courage and commitment of Scotland's servicemen and women on Remembrance Sunday. Alex Salmond said: "Their sacrifice has protected our way of life". He joined military leaders, veterans and serving personnel at the Stone of Remembrance at the City Chambers in Edinburgh. 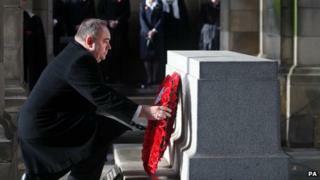 The FM observed a two minute silence and laid a wreath on behalf of the people of Scotland. Also in attendance was the Rt Hon Donald Wilson, Lord Lieutenant and Lord Provost of Edinburgh and Michael Moore, Secretary of State for Scotland. Mr Salmond then attended a Service of Remembrance at St Giles Cathedral. He said: "Today presents every man, woman and child in Scotland with the opportunity to pause and reflect on the immense sacrifice which so many have made to protect our way of life and freedom down the years. "This moment allows us to pay tribute to all of our servicemen and women, past and present, who have laid down their lives in defence of our country and whose sacrifice will never be forgotten. "It is important that we also remember that today's commemoration is not simply about historical events but also about the sacrifices servicemen and women today continue to make."